My iphone 7 won’t turn on or turn off after when i have updated my device. I really scared why isn’t my iphone turning on after just 2 months. Many of the iphone 7 users are being facing this issue. These issues are most commonly reported and we have solved this iphone 7 screen wont turn on issue after our own experience. Even i was very much worried when my iphone 7 won’t turn on, i just thought of repairing it but the apple devices charges are quite high so i just want to ensure the problem of my device also this is same as the issue of iphone 6 not turning on. So literally i found the solutions for my problems. With our own experience we are here to solve the issues of iphone 7, basically this iphones are having power issues, and with these the new devices doesn’t turn on or gets strucked so when we try to turn off iphone 7 then it does not respond for some minutes. After a lot issues which we got in forums and mails we will show the problems and its solutions for the iphone 7. All the iphone devices gets the same type of issue like iphone 7 won’t turn on or screen went black. All these issues are solved here. If your iphone 7 wont turn turn with out any perfect reason then dont worry it will sure be back without any issue. But check that your device is not physically damaged. You can follow the steps below and help your iphone 7 to back. Press Volume and power key at a time for 5 to 10 secs. Press the keys till the apple logo appears. Now release the keys and check any changes on the screen. Now your iphone 7 will be turned on and it will work same as the before. This is process the technicians do for how to fix a phone that wont turn on. Also it will soft reset the device and your iphone 7 will not effected by this process. In case if your iphone 7 wont turn on after doing soft reset then follow the next step. In case if your iphone 7 not turning on after the soft reset then we must check the battery conditions, like that whether the battery is left or not. To check the battery issues firstly charge the device for upto 10 minutes, in case if the device turn’s on then it will be fine. In case if the device wont turn on then check the sockets and battery components are damaged or working perfectly. Check the charging pin is not broken. Is there any physical damage to cable. Ensure the charging port of iphone 7 is clear. Use a different charger and check. After this check whether the iphone 7 is not physcially damaged. In case if the device is fallen down then the mother board inside the device may shortly gets damaged in that case we need to change the circuit. If your device is fallen in any liquids like water then don’t turn it on immediately, clean the device and clear the ports and then charge the device for about 15 minutes after that turn it on. In all these cases your problem of iphone 7 won’t turn off or turn on will be solved, even if the issue is not recovered then you need to contact your nearest your apple store. You can call to the apple store and book a issue. 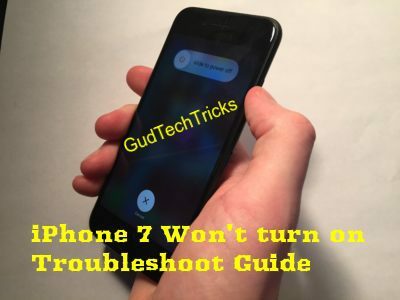 The troubleshoot issue of iphone 7 wont turn on is fixed with this guide, hope you will get the solutions for all the problems of iphone 7, you can share the problems with us, we will provide the solutions for all the queries. Also share this article in the social sites for more interest. Visit Gud tech tricks for more information.